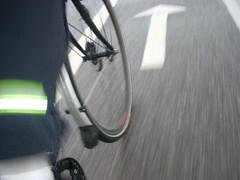 Fenders also protect your bike by helping to keep dirt and road grit away from your frame and out of your moving parts. Full Fenders allow me to ride in the heavy mist that Californians like to call “rain” with only minimal wetness. I wear a rain jacket and sometimes wear rain pants, but with full fenders and a mudguard my shoes get only a little damp and my socks stay completely dry. My raingear only needs to be water resistant rather than water proof and seam sealed, which saves me money and gives me more options on riding wear. I’ve cycled through thunderstorms in the U.S. Midwest and Texas and even a typhoon or two in Tokyo. For the Californians on the list, fill a bucket with water, toss in a tray of ice cubes (for the hail) and have a friend throw the contents on you — that approximates about half a second of a typical Midwestern spring storm. In downpours like this you’ll get wet even with fenders, of course, but fenders are still useful to protect driving spray from penetrating your bottom bracket and headset. (I comment a little more about California rain in my personal blog). Even in these areas, fenders keep you dry when you venture out after the storms, when your tires throw grit, sand and salt up into toward your clothing, frame and moving parts. In my opinion, if you can’t install full length fenders, you probably shouldn’t even bother installing them. Full length fenders curve all the way around both wheels. The rear fender should extend from the bottom of the seat tube all the way around the top of the tire and back almost to the level of the axle. The front fender doesn’t have a tube to protect in front, but it should wrap from in front of the fork to about the level of your feet when the pedals are horizontal. A mud flap at the bottom of the front fender keeps your feet dry. Many Americans have road racing bikes with absolutely no provision for fenders — there are no fender mounts, and even if you have the mounts there’s no clearance between the tires and brakes to fit a fender. A good compromise solution is Planet Bike’s SpeedEZ Road Fenders. They’re only half fenders so the rear fenders won’t protect your seat tube, but they will prevent the stripe up the back, keep your shoes dry, and protect your downtube and bottom bracket. Short fenders fads come and go; recently, we mentioned Ezra’s short Fast Boy Fenders. They look beautiful, and though I’ve never tried them I’m dubious about their actual utility. If somebody uses shorty fenders like this let me know if they actually work. I have used clip on fenders. They’re a useless waste of money as far as I’m concerned. I’m talking about the kind that attach to your seatpost with some sort of quick release mechanism. Even when they don’t swing out to the side, they provide zero protection for your bicycle and almost no protection for your backside. I use the Planet Bike Freddy Fenders SpeedEZ ATB on my daily commuter, which is an old steel MTB frame with front suspension and 2.3″ slicks. I needed the “SpeedEZ” version because there were no fender mounts on my suspension fork, and the EZ version attaches to the suspension boots. Keeps me dry and most of the crap off my bike, even through all the weather we’ve been getting in the Northeast recently. The biggest problem I’ve got is the water off the rear wheel tends to exit the fender in the middle of the rear triangle, right at ankle height, so when it’s really wet out, my shoes and socks get soaked. Thanks for mentioning those, Tarek. I was going to note those as an option for suspension forks and forgot. I think Planet Bike did a good job designing these “half fenders’ — as you note, it’s a compromise solution but certainly better than nothing and better than clip ons. The SpeedEZ ATB are actually full-wrap fenders. Upon further inspection of the full range of PlanetBike fenders, it looks like both the SpeedEZ ATB and the SpeedEZ Hybrid are both full-wrap, whereas the SpeedEZ Road are not. The only other thing I would point out is that the rubber straps that attach the fenders to your seatstays and fork legs are fairly flimsy – mine broke after a season or so. I replaced them with regular zip-ties, and have had no problems since. I recently came across this page. He shows you how to make full-wrap fenders out of old election signs! I love it. I couldn’t find any election signs as I was away during our last election, but I managed to find some ‘coroplast’ at work. I’ve been rocking mine through this Ontario winter and they are keeping me quite dry. If you want an inexpensive, yet effective set of fenders, I’d recommend trying them out. Fenders RULE! For years, I was very resistant to them…”they’ll make me and my bike look like losers”. But after a few vicious Florida rainstorms, I started to change my tune. There’s nothing like showing up to work looking like a shipwrecked rat! I have used the Zefal full-coverage fenders — the breakaway strut clips are flimsy and easily lost (and next-to-impossible to find replacements), so I modified the fenders with struts from an old pair of steelies floating around in my shed. I am a big fan of the Honjo hammered/fluted aluminum and Berthoud stainless fenders — heavy but rock-solid — and the attachment hardware and struts are without peer. Yeah, the Honjos look really nice. My oops, Tarek — sorry about that. Thanks for the reminder about the coroplast fenders, Joel. I’ve seen a couple “in the wild” so to speak. I agree with Ghost Rider, Fenders Rule, back when I started biking I was a teen in the mountain biking crowd where the mud cover shins and the “skunk stripe” was kool, and the 50 lb cruiser was not, As an adult commuter, I found fenders to be incredibly useful and nice to have, and now have fenders for both bike I use on-road. They’re a year-round item for my bike. My rear fender doesn’t quite reach down to behind the bottom bracket. Instead, it’s zip-tied in place. Unfortunately, it’s vibrated enough over the last 3000 miles that it’s rubbed all the paint off that part of the seat tube. I have since put a piece of double-sided mounting tape on that side to damper the vibrations. I love my new fenders. I bought some Planet Bike 29er fenders. The fenders were not the easiest mount up because I have a monocog 29er that has no fender eyelents. So I used plenty of zip ties. I will trying to fabricate some mounting harware in the future. The fenders have worked great so far. I love them. They are allowing me to ride all over in the wet, and sloppy winter here in Nebraska. Such things may also be available at your local hardware store. They make fender mounting a snap for eyelet-less bikes. Thanks for the link. I need to do some further investigation at my local LBS or hardware store and get my fenders more securely mounted. So far the zip ties have worked well though. I ended up getting some “L” brackets from my local True Value and used those for the back fender. I am still going to try and find some of those “P” clamps big enough to fit around my front forks. Alright, I have to ask, as dumb as it sounds, but I can’t seem to find a clear answer anywhere… fenders on a mountain-type bike– feasible? Absurd? Short answer: yes, it is feasible to put fenders on a mountain-type bike. If your bike has eyelets, then you’re set – just get a normal fender, ensuring that it is wide enough to cover your tire. A) Seatpost mounted fender – these are garbage, see above. B) Seatstay / fork leg mounted fenders – This is the SpeedEZ fenders referenced above. These will also mount onto most suspension forks, which generally don’t have eyelets. My bike does indeed have eyelets, since I have a rack attached by them. Will fenders fit on the eyelets with a rack already there? Also, though it’s feasible, do many people put fenders on mountain-type bikes if they use them for commuting? I know that a road bike is really the best for commuting but hey, I have what I have and don’t plan on spending thousands of dollars when simply hundreds will do. I’m not too worried about how it will look either. It only took about 2 months for fellow students to stop looking at me wierd when I pulled up the bike rack on campus in a mismatched rainsuit, helmet, and kid gloves riding a mountain bike with a rack and trunk on the back mounted with a headlight and back light :). Being inspired by Ezra’s work, I have made a few sets of wooden fenders and love them. Just getting started, they are far from the detail that he produces, but as far as utility is concerned, I love them. The finished wood brings a classy look to a bike from a piece of wood that was once a pallet. I made my own fenders out of plastic garden border. They work awesome and were super cheap,about 5 dollars. I keep fenders on my commuting mountain bike. I’ve had this set of mtZefal clip-ons for about 12 years now and thousands of road and trail miles. I really only remove them to wash them off. One note about MTB tires and fenders though…. If you ride 2.1″ wide tires you are still going to get sprayed. Swap to something less than 2.0″… 1.75-1.9 (1.75 is better). That’ll keep the water inside the fender. Also, the knobbies on mud tires pretty much defeat the fender, either cut them off (the knobbies) or swap tires (better). Good mud tires will also cause clearance issues and rub fenders. I used to keep a separate set of tires for ‘weekends’ but found that I so rarely used them… I just sold them off and have a pretty good compromize tireset on my MTB now. What about on a track style frame? I think it’s a drag that I will need to undo my fenders to fix a flat. Any suggestions? SKS chromoplastics are my favourites so far. Stylish and light, still providing excellent coverage and good stainless hardware, including break-away mounts for the front end, in case something goes wrong and your fender ends up in the spokes… not very likely with these, but still, a good thing. I use them on my fixed commuter. Fenders are where its at for practical commuter cycling. When mounting the front fender, what’s the best way to keep the tab between the brake caliper and the headest from rubbing? Do I just need to bend and shape it? SKS chromoplastics are my favourites so far. Stylish and light, still providing excellent coverage and good stainless hardware, including break-away mounts for the front end, in case something goes wrong and your fender ends up in the spokes” not very likely with these, but still, a good thing. I made my own aluminum fenders out of aluminum strips from Home Depot. For the stays, I took the wiry things they sell to hold “For Sale” signs. I threaded the ends with a threading die, and to attach them to the dropouts, I used these wire clamps that are used for attaching heavy ground wires to metal. If you want to see pictures. let me know. You left out a reason for fenders. Sprinklers. I have a road bike and mtn bike that I can outfit for commuting. I started out this year on the mtn bike. About a month ago, I switched to the road bike because it’s faster and more comfortable. Now I’m switching back. Why? The mtn bike has fenders, and my route has several spots where I can’t avoid sprinkler runoff, and this runoff winds up on the spout of my water bottle, rendering the remainder of the contents of my water bottle useless for the rest of my commute. And they are a safety item. Swerving to avoid puddles is a bad idea. It’s a good idea if you don’t know the puddle’s depth! I’ve got big feet, size15; this causes a problem with full fenders as my feet often hit the front fender. Another problem is that plastic fenders get warped orbrittle due to the Arizona sun.